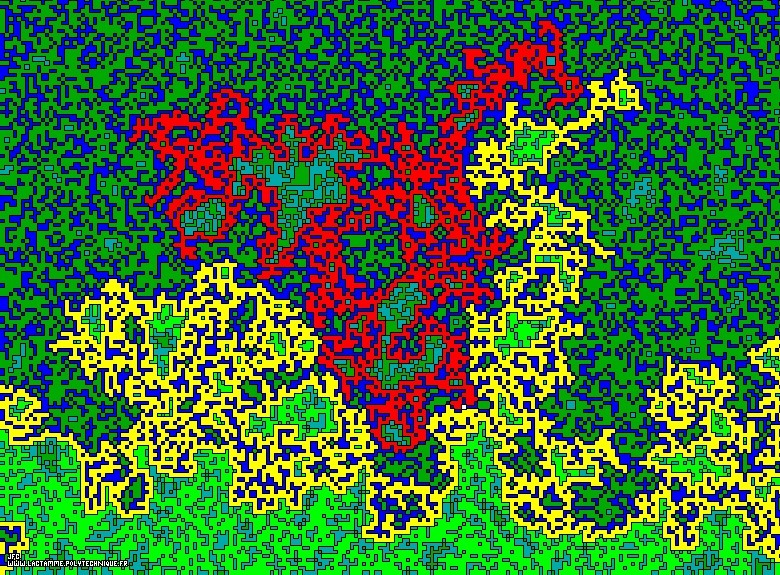 The 'island-peninsula' phenomenon of the fractal diffusion front in a bidimensional medium obtained by means of a random walk process [Le phénomène 'île-presqu'île' du front fractal de diffusion dans un milieu bidimensionnel obtenu grâce à un processus de marche aléatoire]. The white point belongs to the "Shore" (yellow) -a fractal object with a dimension equals to 7/4-. If this last point moves to the right-hand side neighbour site -that belongs to the "Sea" (blue)-, then the very small red subset disconnects itself from the "Shore" and becomes an "Island" when conversely the very big red "Island" connects itself to the "Shore". Copyright (c) Jean-François Colonna, 2007-2016. Copyright (c) France Telecom R&D and CMAP (Centre de Mathématiques APpliquées) UMR CNRS 7641 / Ecole Polytechnique, 2007-2016.